Mission Rose: Change of Plan! When feeling your way through an embroidery project for the first time, it isn’t unusual to change your plans for embroidery techniques as you progress. You might, for example, have an idea that you think is brilliant, that you’re sure will work …. but when it comes down to actually trying it, the Cold Dead Fish of Reality slaps you in the face with a resounding Nope! And that’s what happened to me recently with the Mission Rose project. I was all geared up to tackle the blue silk areas – I had a Plan! I liked the Plan! In my head, the Plan worked. With the blue silk background, I had this notion that the blue helped to convey the whole idea of a kind of “window” for the piece. Not that the Mission Rose is supposed to look exactly like a window, but I liked the idea that it imparted a mild suggestion of a window. And the blue, in my mind, enhanced that impression. But I didn’t want the blue to remain unadorned. It needed something over it – something that breaks up the blue a bit and also aids in reinforcing the security of the appliquéd fabric. A kind of lattice work over the blue seemed the way to go, because it would echo this idea of a “window.” Besides, I liked the idea of incorporating some lattice work into a goldwork project, after playing around with different lattice techniques on the Lattice Jumble Sampler. It seemed to be a good way to demonstrate how playing with stitches translates into application in other projects. I sketched out different options of line angles and widths on a print out of the original pattern. And while a diamond lattice would have been ideal for the whole window idea, the diamond shape looked odd behind the marquise shape of the center of the design. 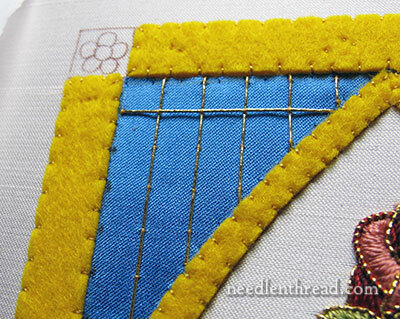 So instead, I set about working a square lattice (trellis) design using gold smooth passing thread over the blue. I measured and marked the points where the laid threads would begin and end, using a fine tipped marker right next to the yellow felt outline. In the photo above, you can see the first couched lines. Before those were all the way in, Twinges of Uncertainty were already setting in! But with the first line crossing the verticals in, I knew. I didn’t like it. And I knew I wouldn’t like it. It’s good to realize fairly early in the game that a technique just isn’t going to do it for you! Besides the fact that I just didn’t like the rigidity of a lattice filling here, the thread choice causes a difficulty. Smooth passing thread is not a supple thread – it is somewhat flexible, but it is not limp and supple. So the cross lines on the trellis sit up on top of the vertical lines underneath, creating a very definite shadow – a fact that I had not taken into consideration at all during the planning stage. You can see the effect better in the photo above, with the light at a slightly different angle. Even with the intersections couched (there are tiny couching stitches at the intersection, though you can’t really see them well in the photo), the thread sits too high. And couching in between the verticals would make the line look wavy. Opting for a different thread was a possibility. 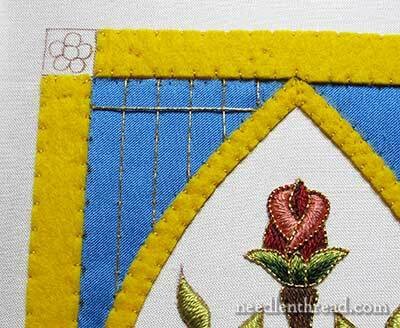 For example, gold tambour thread like the kind used on the Tudor-style rose could possibly work. It’s a bit more flexible, so it would probably not sit, high and stiff, upon the the vertical threads in the same way. But… the tambour thread was too bright a gold. And then there’s Elizabethan Twist, which is a flexible, very fine twisted gold thread. It might have worked ok. But I didn’t like the rigidity of the squares. I decided a lattice design over the blue just wasn’t going to do it for me. And so I scrapped it, in favor of a different technique. Any guesses on what that technique is? It’s not going to convey the same “window” impression, but it’s a technique I’ve used before and that I like a lot. I’ll make a little more progress on that, and share it with you soon! If you’d like to follow the Mission Rose project from start to finish and watch it develop, you’ll find all the articles relating to this project listed in chronological order on the Mission Rose Index page. 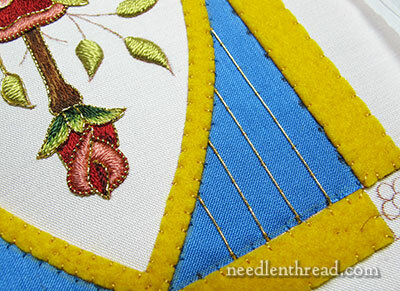 You’ll also find articles that include the embroidery pattern, all the materials used and explanations of techniques. So now that you have a new plan, can you/do you salvage the gold you’ve cut? I never though of lattice. I’m seeing some curlieques and *maybe* small leaves. To go with the ones beside the rose. The mission rose itself is looking gorgeous and I always enjoy your updates on it – but I couldn’t agree more – the lattice is NOT going to work! 🙂 And yes, I have those moments ALL the time – but unlike you I have an unfortunate tendency to give up! The idea of this project depicting a window panel makes a lot of sense and explains several of your choices. You are right that the square lattice doesn’t work. The lattice divisions are too small compared to the center section. Well, I agree, this didn’t work. But you never know until you try! I really appreciate seeing the false starts as well as the successes. It makes me wish I had taken more photos of mine, but sometimes I am in too much of a hurry to pull it out while my conviction is still strong, lol! Otherwise I could easily compound the error. Can’t wait to see the next version! I am glad you changed your mind, the square lattice is a bit too heavy and formal to my eyes. As for guessing what’s going to go in its place, hmm, maybe a filling of meandering squiggly lines? Or perhaps the lattice set diamond-ways in silk, with the diamonds higher than they are wide, and with little bits of gold at the intersections? There are so many possibilities, Mary. I’m eager to find out what you eventually choose. Yes, I get the window reference and I thought that diamonds was a good idea but I can see now that you would have the same problems as with the squares. My money is on Vermicelli Goldwork! I think the meandering lines will suit the rose design more so than a lattice. Hmmm, I like the idea of a window and am picturing the stained glass church windows. I too wonder if the diamond pattern with decorative centers would convey that idea? I look forward to seeing what you work out! Yes I agree the lattice doesn’t look right perfect couching though. I can’t guess what you are going to do? if you are going with the vermicelli as the other readers have suggested I think that would be more suitable it’s not so rigid as the lattice goldwork example. What ever you decide I know it will look great, can’ wait for the next instalment. I agree! The lattice work is to rigid for this. When you had stated you were going to do gold work in the blue, I immediately thought of the meandering pattern you used on the ecclesiastical embroidery project. I don’t know why but to me it seemed to “fit” the space better. You might like the couching better, if it echoed the curve of the inside border or if the checkerboard were done on the diagonals instead- like diamonds. Just a thought. You do such beautiful projects. I love following your progress. Thank you for sharing such beauty. The suggestion of vermicelli work seems not a bad one to me. But it’s very hard for me to imagine what would be best while that yellow felt border hasn’t been worked. I can understand that you want to work it later since it needs to cover the edge of the blue applique but it seems such a prominent feature that my eye just can’t get past it. Looking back at the piece that inspired this I saw that there were flowing leaves that related well to the central motif over the frame and area that is blue. Maybe something like that. I think the central motif needs to be more related to the blue and frame. Perhaps stitching that “echoes” the shape of the central motif. On reading the article my first thought was “vermicelli” and it’s interesting to see how many others shared the same thought. It looks like the frame will be heavily worked in gold, so you will be wanting a lighter effect I expect. With gold threads, vermicelli seems a good possibility. The other thought I have ismaybe step away from gold and embellish the surface of the silk in an identical or very similar shade – blue on blue. Possibly a lattice but I think leaves and curlicues would be better. The thing about that approach is the possibility of introducing “victorianisation”… I’m really looking forward to the result. I don’t have the experience to predict what you may use, and I look forward to learning even more from your answer. I agree. I love the expression! I think the little seed stitches would look lovely. You could decide just how much coverage you want to secure the applique, get a bit of flash on the blue, but not so much as to compete with the gold going on the felt. But, everyone has different taste, and I really like that little seed stitch! Vermicelli is what comes to mind, but in looking at the background on some old ecclesiastical pieces, the other thing that comes to mind is meandering couched scroll work. It’s kind of the the vermicelli. But is is a more defined scroll type couching. It’s hard to describe. It might have more starts and stops because of the scrolls. I’d create some kind of a pattern that fits the space and then flip it mirror image for each section. I think there are some examples of this in the one of the old books – Lucy M (can’t remember her name but it’s 1939 copy right). I am always encouraged when I read that you try things and take them out. I am working on a gift for my mother that is at the far edge of my skills and have one area that I have stitched, ripped, and revised 3 times. Everytime, I would think if Mary Corbet rips, then so can I. Thanks for fostering stitching courage. Mary, I think this project has caused you more grey hairs than any other I have followed. In this instance I agree, the lattice doesn’t work, and I am in the camp of the many: I think you will fill the space with vermicelli in very fine gold. I wish I knew what was going on the yellow felt though, as that may very well affect the rest. Isn’t it wonderful how we all take some kind of ‘ownership’ in your projects? Or not …. Vermicelli couching? With a VERY fine gold thread? Just to give a light overall and definitely non-rigid background look that will contrast with whatever you put over the gold felt? Janet. I’m thinking gold threads in the form of a “glory” background – like a “glory sky” when the sun comes out after an afternoon rain and rays shoot out from behind the clouds. When you originally said you were going to ‘adjust’ the blue background and not to worry, I figured you might do a vermicelli stitch… I did not think a trellis (especially diamond shaped) would look good – too rigid and static – it’s formal and upright enough – So, is it going to be wavy waves, or curly cues or some other moveable golden feast? The Cold Fish of Reality!!?? I love it!! Previous Previous post: Overdyed Embroidery Thread – A Give-Away! Next Next post: Stitches & Colors & Letters – Oh My! Your Thoughts?